The RAV4 might have been at the forefront of the small on-road off-roader but it’s no longer at the top of the class. It's still a capable all-rounder and a good used buy, but it is surpassed on the road and in style - inside and out. It's dependable though, and certain reliability counts for a lot. Toyota’s original RAV4 broke new boundaries, mixing 4x4 styling and stance with hatchback driving dynamics. That remains true today, even if the RAV4 no longer has the marketplace to itself. It’s one of the older cars now out there, with this current model introduced in 2006 and facelifted twice since. It remains competitive though, and makes a fine used buy. Both four- and front-wheel drive models are offered, in either petrol or diesel guises. Combining the best of 4x4 and hatchback before anyone ever dreamt up the term 'crossover', Toyota’s RAV4 is a fine driving family car alternative. This model has been around since 2006, it having been facelifted to freshen up its styling since. 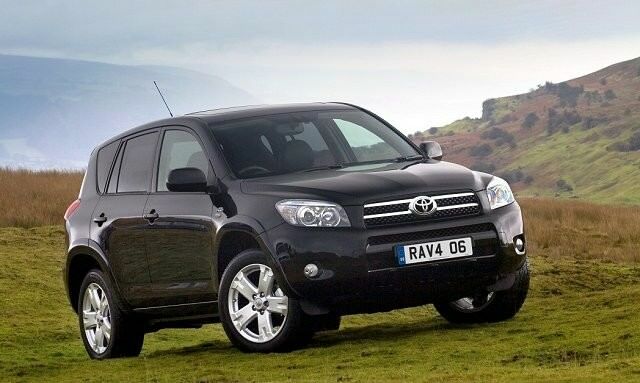 The latest was in 2011, with the RAV4 getting a deeper grille and new headlamps. Underneath it remains largely the same, which means a choice of front- or four-wheel drive models with the option of petrol or diesel engines. The four-wheel drive will get you further off road, but it’s no mud-plugging 4x4 in the conventional sense, its additional driven wheels giving better traction and stability on the road. Two trim levels are offered, Luna being the entry model and Sol the higher specification version. Choose it and you’ll gain Bluetooth telephony and a leather steering wheel with audio controls on it, though the Luna certainly isn’t a poverty specification model - coming with air conditioning, alloy wheels and all the safety equipment of its more expensive alternative. Automatics are available, but only when combined with 4x4. Solid build, assured reliability and decent space and comfort combine in this appealing alternative to family saloons or estate cars. A 2.2-litre D-4D turbodiesel with a conventional manual transmission and four-wheel drive is the best all-round proposition. It achieves 5.7 litres/100km on the combined consumption cycle. There are plenty of used examples out there so specified, the majority of which are Luna trim. Even though it’s not exactly in the first flourish of youth, the RAV4 drives decently and is comprehensively equipped - even in Luna - t0 make it a sensible used car choice. A good all-rounder.